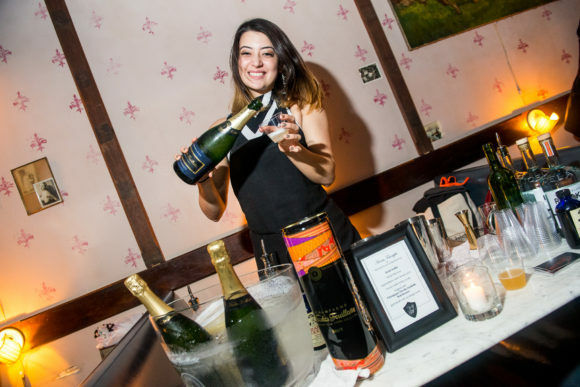 With events like New York Champagne Week, which is only in its second year and has already experienced an incredible amount of notoriety, it brings to mind an important question about the future of champagne as not just a celebratory beverage on its own, but a key player in the cocktail world. 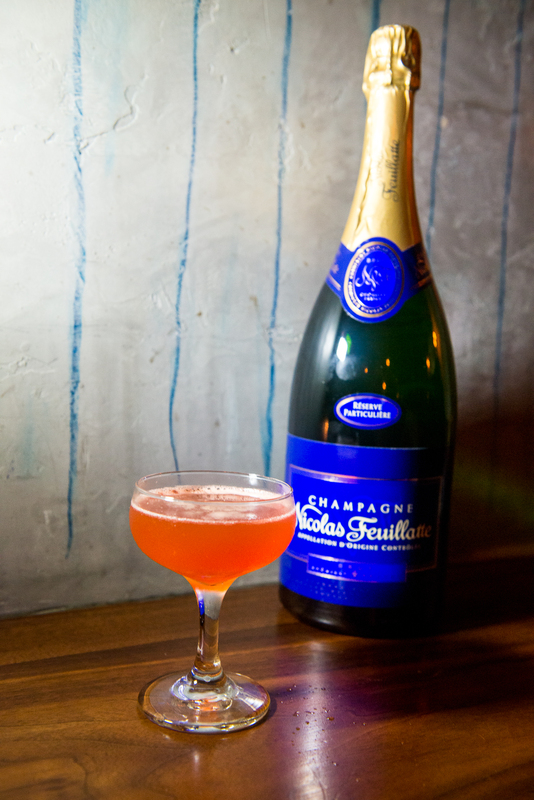 The French 75 and the Kir Royale – both cocktails that feature champagne – are staples in the classic cocktail category, but as we’ve seen from events such as this one on Nobember 4th, versatility is the name of the game. Champagne and cocktail lovers alike came together for the first consumer event of New York Champagne Week 2014 to see bartenders from around New York City compete for the title of best champagne cocktail. 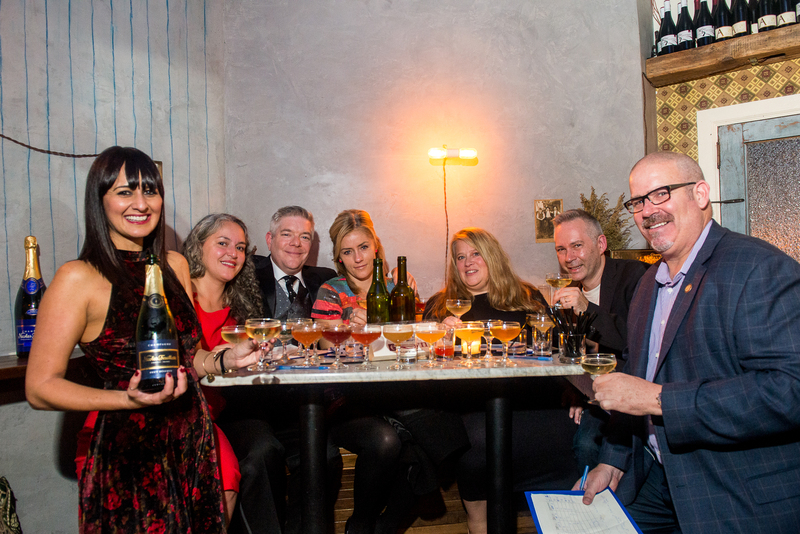 Sponsored by Nicolas Feuillatte, these competitors took over Evelyn Drinkery and created some truly outstanding tipples for people to sip on and enjoy as they talked about all things bubbly. 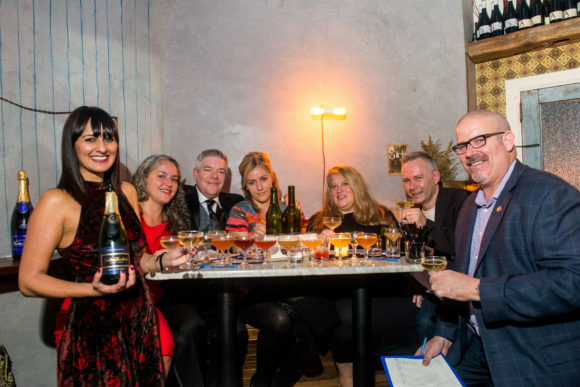 The competition ended with a bit of a twist; two competitors came away with the first place trophy, that trophy being a magnum bottle of Nicolas Feuillatte and the possibility of having their cocktail featured at Tales of the Cocktail 2015. 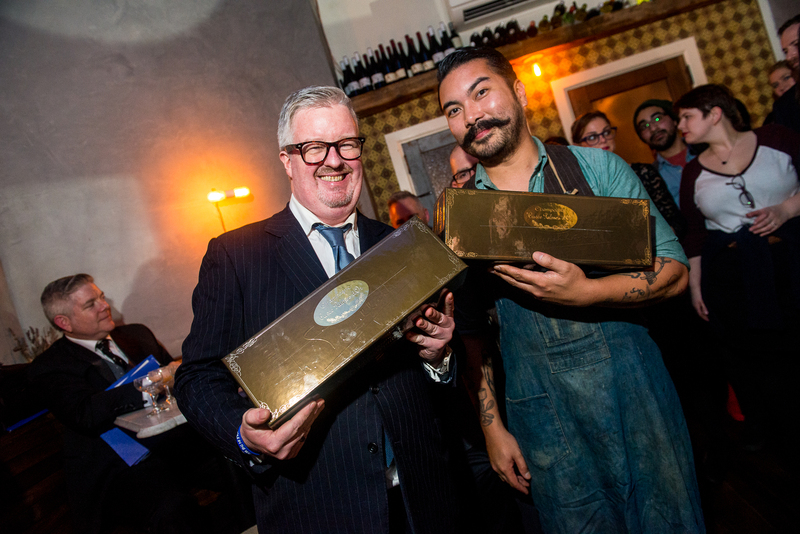 Marlo Gamora of Jeepney and James Menite of The Plaza Hotel were crowned the two winners of the evening, with Micaela Piccolo of Distilled NYC coming away with the People’s Choice award. A tie in a cocktail competition is fairly unheard of, but it signaled something exciting that industry insiders have known for a while; that Champagne cocktails are on the rise. 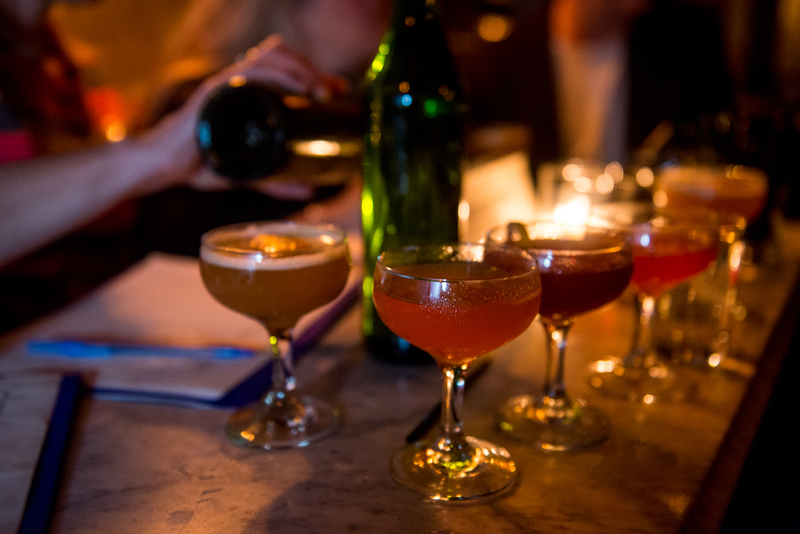 It also means that competitions like these are finally being seen as ways to showcase the creative use of a base spirit like Champagne, and not just for bartender bragging rights or awareness of a certain spirit brand. In a display of excellent sportsmanship, Gamera and Menite accepted their equal first place win with joy, hugging it out and congratulating each other on a job extremely well done. Whereas most champagnes ring in with a fairly hefty price tag, making working them into a drink menu not the economical choice for using in cocktails, Bigelow believes it’s brands like Nicolas Feuillette that end up coming out on top based on the low price point and the younger and hipper personality. Cocktail innovation tends to be the focus for many of these competitive events, but there is also an element of education that comes in as well. Mixologists of this caliber know what makes a good cocktail great, and by discovering that champagne serves as the perfect balancing agent, it’s only a matter of time before the bubbly becomes a regularly featured ingredient in many a cocktail. The cocktail industry sees its fair share of changing trends, with a particular drink being all the rage one day and yesterday’s news the next day, but when it comes to champagne cocktails, the attitude is fairly clear; they aren’t going anywhere. 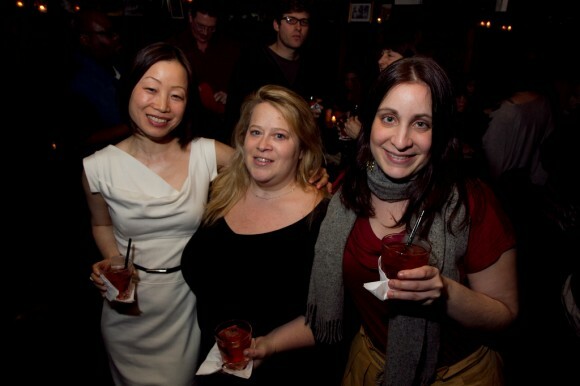 www.hannaleecommunications.com) and Alia Akkam of Beverage Media (www.bevnetwork.com) and I shared with the USBG New York Chapter members recently at a monthly meeting held at Macao Trading Company (www.macaonyc.com) as Lee introduced her PR 101 program. In short…RETURN MEDIA QUERIES! Seriously, people. Wonder why so and so is getting all the press and you’ve worked longer or harder than they have and never get featured? Hmmm, maybe that’s because when the media calls, you don’t respond. Or maybe it’s because they don’t know how to find you. Well, that stinks. But it’s easy enough to change. If you walk away with only two things from this story, remember this: 1) Return media queries (as noted above) and 2) Content is king. Oh sure, sometimes it’s glamorous; famous people coming in for your drinks, keeping the party going and being recognized as the ringleader of it all, phone numbers and propositions flying across the bar. But the truth is, you work hard for your money…long shifts with wet hands, satisfying customers who don’t know what they want but know they don’t like gin until you make them a gin drink without telling them it’s gin and they tell you it’s delicious, hours spent perfecting a cocktail recipe, planning that drink menu, batching five gallons of cocktails for a charity event that you graciously donate your time to, keeping a straight face when the liquor salesman comes in to sell you something that has absolutely no application at your bar and it’s obvious he hasn’t a clue about his product, the list goes on and on. And it’s all chronicled in Bar Diaries with Naren Young and Simon Ford; taking you behind the glitz and glamour of tending bar. Mix It Up NYC with Don Q from Francine Cohen on Vimeo. Leave it to DonQ rums (www.donq.com) to hold their cocktail competition in a space (almost) nobody had seen before, revealing the country’s best rum cocktails that (almost) nobody had tasted before in New York. Though New York City’s fire department officially frowns on Albert Trummer’s pyrotechnic show at his Chinatown cocktail den, Apotheke, thankfully they were nowhere to be found on May 17th during the Manhattan Cocktail Classic (www.manhattancocktailclassic.com) as the judges for the DonQ cocktail competition’s US finals dodged workmen busily putting the finishing touches to Trummer’s latest venture, Theater Bar. After an hour or so of ducking out of the way as wallpaper was smoothed and lighting fixtures affixed to the wall, a sneak peak taste of the soon to be released Blackbeard Spiced Rum was shared before the taste tests began. 15 cocktails were sipped and assessed; each featuring DonQ Rum. The competitors were evaluated on their use of the spirit, drink flavor, and presentation by judges Tony Abou Ganim, Francine Cohen, James Menite and Albert Trummer. The prize? Five winners were to head to Puerto Rico in June to represent the United States in a cocktail throw down against the Puerto Rican team. The fabulous five selected to represent the United States: Tony Devencenzi of San Francisco; Noah Heaney of Denver, CO; Charles Joly of Chicago; Brian Matthys of New York City; Darren West of Las Vegas. Ultimately, the overall competition winner was from Puerto Rico, Hiram Avila. In a cocktail shaker, add rums, ginger syrup, fresh cucumber juice and ice. Shake vigorously and strain over martini glass. Garnish with cucumber slice and a sprinkle of sparkly sugar. To make cucumber juice, use 2 cucumbers and a juicer. If a juicer is not available, add 2 unpeeled cucumbers and ¼ oz. of water to a blender. Blend on high speed and strain mixture. Cheers to an amazing Manhattan Cocktail Classic (www.manhattancocktailclassic.com)! Five days and evenings of parties, seminars, tastings, luncheons, dinners…and of course, lots of cocktails. I couldn’t resist the opportunity to ask many of the notable bartenders, chefs, panelists and event hosts in attendance about their favorite things to do in New York City during the summertime. 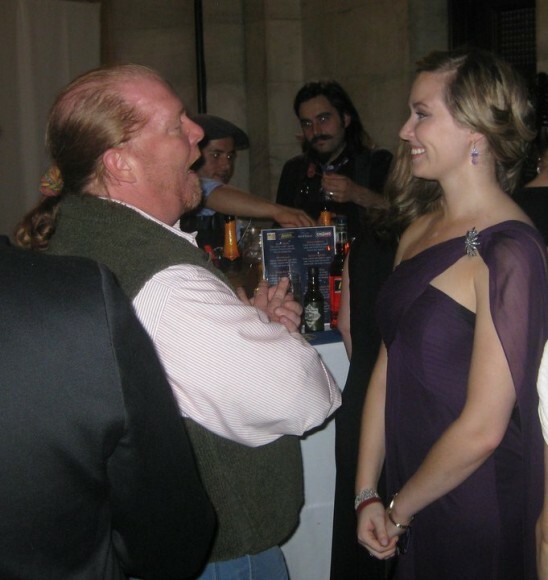 Mario Batali (Celebrity Chef, Television Personality and Former James Beard Chef of the Year): “Pier 40 (www.pier40.org) . I really love going there to watch my kids play ball.” The Chef makes an excellent choice. My husband plays rec. soccer here, too, and it’s also fun (and free) to kayak through the Downtown Boathouse (www.downtownboathouse.org). Jon Bignelli (Chef de Cuisine, wd-50 www.wd-50.com and Food Network “Chopped” Winner): “I love anywhere that lets you sit outside and enjoy an ice cold beer. Gowanus Yacht Club, for instance, or any beer garden.” When it comes to cocktails, he and others from wd-50 love PDT and Death and Co.
Richard Boccato (Proprietor, Painkiller, Co-owner, Dutch Kills): Richie offered another vote for Prospect Park, and spending a lazy afternoon relaxing there. Michael McIlroy (Panelist, Manhattan Cocktail Classic and Bartender, Milk and Honey, Little Branch): Winter, Spring, Summer or Fall, Michael always enjoys paying homage to his heritage. And what’s the best way to do that? “Drink at McSorley’s,” he says (the renowned Irish pub dating back to 1854). Sasha Petraske (Proprietor, Milk and Honey, Little Branch, White Star, Dutch Kills, The Varnish [Los Angeles] and cocktail consultant): Sasha honed in on a classic New York City spot: “Grand Central Station or honestly, a cab to JFK” (admitting to another trend among New Yorkers who escape to avoid the city heat). He also enjoys strolling the semi-deserted streets of the Financial District post-closing bell. As a former Battery Park resident, I tend to agree — it feels like the city is all yours after Wall Streeters and tourists head out of town. Lesley Townsend (Founder, Manhattan Cocktail Classic): “I love bringing my dog during off-leash hours to Prospect Park.” Lesley also noted the stellar picnic potential. “To avoid using plastic cups, I bring Reidel stemless glassware and a bottle of champagne” (so she doesn’t have to worry about a wine corkscrew). Phil Ward (Proprietor, Mayahuel): Phil didn’t name one spot or activity in particular, but discussed how he loved the freedom of spending more time outside and meandering around the city’s streets. My pick? For me, it’s all about the private rooftop. I admittedly tend to cringe when friends suggest visiting public roof bars, only because they’re usually packed and come with poor drink quality plus high prices. Of course, having your own outdoor space is ideal, but you can become an honorary deck guest with just about anyone by bringing quality drinks and / or tasty foods if you’re ever invited over (please note, I enjoy bubbly and chocolate covered-strawberries). What are your favorite NYC Summer picks? You’ve toiled in the front of the house for how many years now, listening to management and biting your tongue as you know that that paycheck means eventual freedom and you just need to mark time until you can open your own place and do it right? But can you? Do you have what it takes? Do you even know what it takes to run a profitable bar and avoid the pitfalls and traps that cause a high percentage of new bar businesses to fail within the first 18 months? Hedge your bets and join us for Booze 2.0: Beyond Slinging Drinks (5/17, 11:30 a.m.) – The Manhattan Cocktail Classic’s insightful panel discussion with some of this country’s most successful bar owners and managers. For ticket information and to purchase yours for the event please click here! In a discussion moderated by INSIDE F&B Editor in Chief Francine Cohen (aka yours truly) Jason Littrell (Death & Company www.deathandcompany.com, Dram www.drambar.com), James Moreland (Bombay Sapphire www.bombaysapphire.com) , Gianfranco Verga (Louis 649 www.louis649.com), and Dushan Zaric (Employees Only www.employeesonlynyc.com, Macao Trading Company www.macaonyc.com) will tell you how to get liquor on the shelves, put butts in seats, and keep engaged, and enthusiastic bartenders behind the bar. 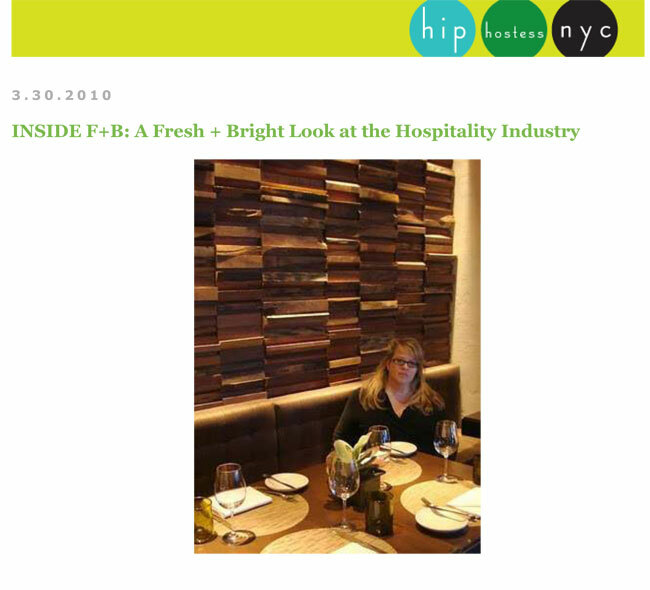 Hip Hostess NYC sits down with Inside F&B editor-in-chief, Francine Cohen. Click the link below to read the full article! INSIDE F&B Editor-In-Chief, Francine Cohen, along with a panel of some of NYC top cocktail and culinary minds gathered together on May 19th for the Manhattan Cocktail Classic to discuss some of NYC best summer spots. 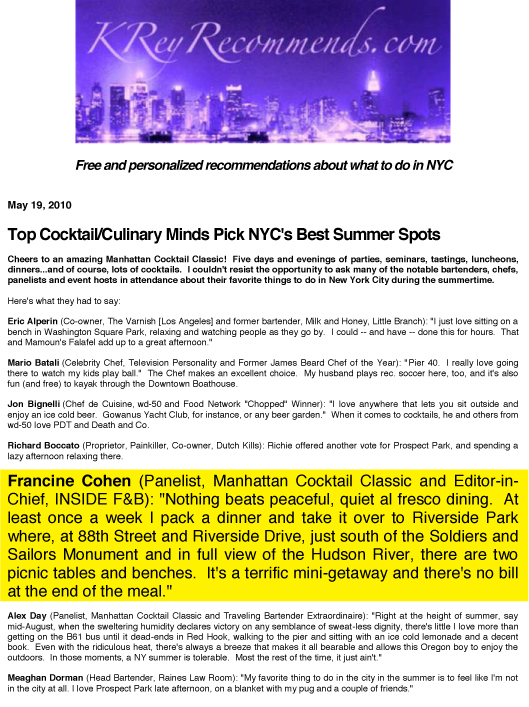 Read the release below to see what Francine and other minds had to say about their favorite NYC Summer Spots!